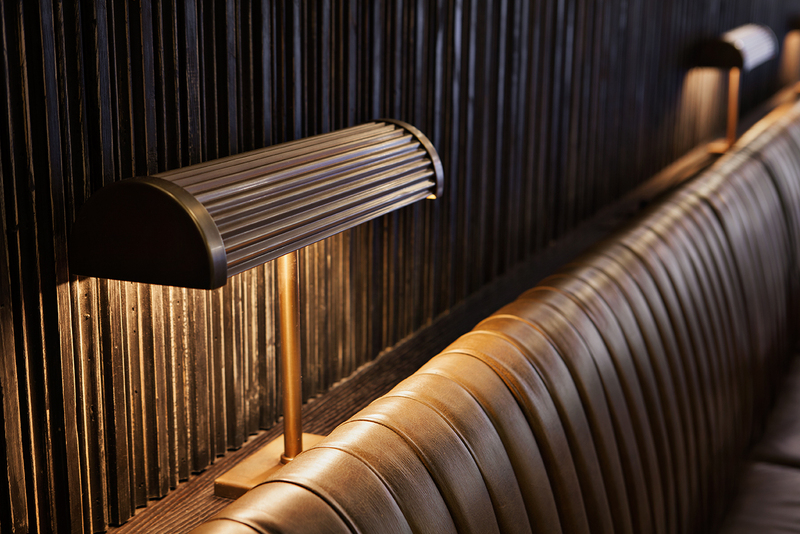 We worked with Martin Brudnizki Design Studio to produce banquette lamps for the new Jackson + Rye restaurant, café and bar in Wardour Street, West London. Whilst at first glance they may look like fairly standard light fittings, the craftsmanship skills involved in their manufacture at our London factory are believed to be unique in the UK. Each of the shades was made from sheets of brass which were folded by hand. This was an extremely time consuming and labour intensive task but the only way in which the beautiful end result could be achieved with such brilliance. LED lamps have been used for the benefits they bring in long-life and energy saving, with filters fitted so that the light generated is warmer than that usually emanated from LED. The lamps were finished in antique brass.